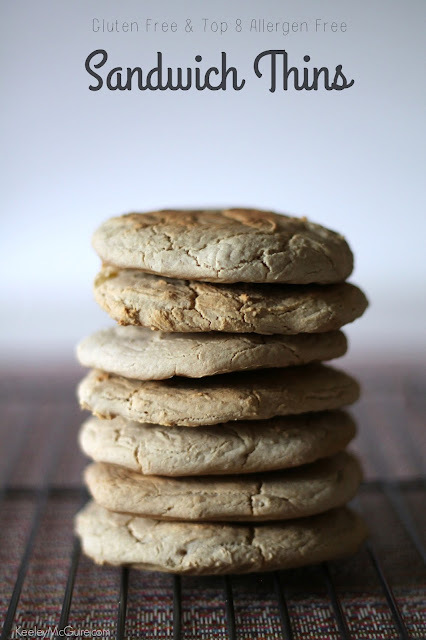 Over the years I have followed amazing gluten free and food allergy free-from blogs. Some of the authors have even become personal friends. I look at their recipes. I drool. I want to make them. But I don't. And it's meant to no offense to them. Sometimes they contain a nut based flour. Or sometimes a flour that can't be purchased locally. Or more often than not, it's a flour blend where I have to literally go out and buy six bags of different flours just to create a special blend they want for the recipe. I understand that it's what makes it "just perfect". But, for me, it's just not happening. If I can't make it with an all-purpose flour, then I'm not going to bother. I just don't have the money or pantry space to invest in the others. It's also sometimes difficult to find top 8 free alternative flours that are needed for those special blends. Many contain CC warnings. Thus why I started testing this Sandwich Thin recipe to begin with. I wanted it to be easy. 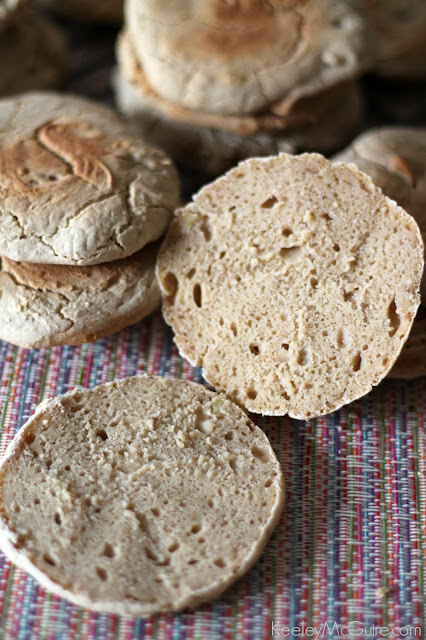 I wanted it to use a gluten free AP flour, I wanted it to be top 8 allergen free, and I wanted it to be something geared towards my readers - something you could use in the lunch box, of course! The recipe is based off a traditional Amish Potato Bread recipe, but altered/ adapted to be gluten free and top 8 allergy free. The recipe calls for 1/3 cup of mashed potato. This is what helps give the bread moisture and texture. You can just microwave a medium size peeled potato to achieve this. I like to just throw an extra potato in if I'm already boiling some for potato salad. A few minutes to prepare. Let it sit for 30. Then bake, flip, bake, and cool. Super simple. What you're left with are awesome little rounds that are toasty on the outside and soft and delicious in the center. They can be used as sandwich thins, when you slice them in the center, or you could use them as a bun for a burger. When this batch was cooling, I actually enjoyed one with strawberry jam. They're so versatile. The recipe yield 18 whole sandwich thins. So depending how you want to use them, you could have 36 half slices if you just want to use them like a slice of toast. Enjoy them within three days after baking or freeze part of the batch for use later - we all know I love my freezer and I have a bag full in mine right now. In a large mixing bowl, add the yeast packet and warm water. Whisk or mix until yeast is dissolved. Add the non-dairy milk, butter, mashed potato, sugar, salt, xantham gum (if needed), baking soda, and cinnamon. Mix again. Slowly add the flour. Start with two cups. Mix until smooth. Add the rest of the flour, 1 cup at a time, mixing in between until smooth. Spray a piece of plastic wrap with non-stick spray and cover bowl (sprayed side facing the dough). Let sit for 30 minutes in a warm place. I went ahead and turned on my oven to preheat at 350 degrees and let it sit covered on top. After 30 minutes has passed, preheat oven to 350 degrees if you haven't done so already and line a baking sheet with parchment paper. Taking a large spoon, scoop out the dough and form a 4" round approximately and smooth out the top. Repeat until baking sheet is filled without them touching. (I baked mine on a standard size sheet 6 thins at a time). 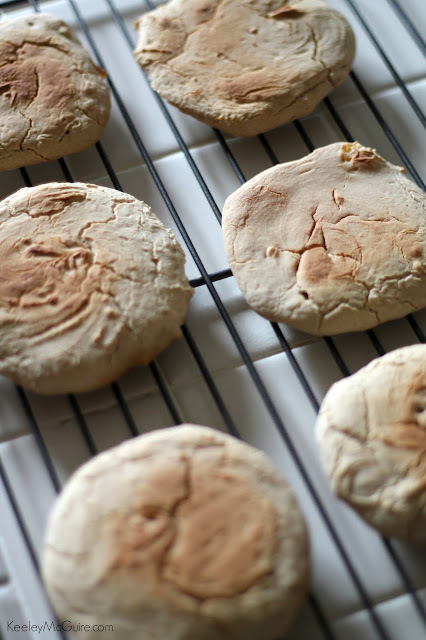 Bake for about 10 minutes, flip the thins, and bake 8-10 minutes more. Let cool on a cooling rack before slicing or freezing. 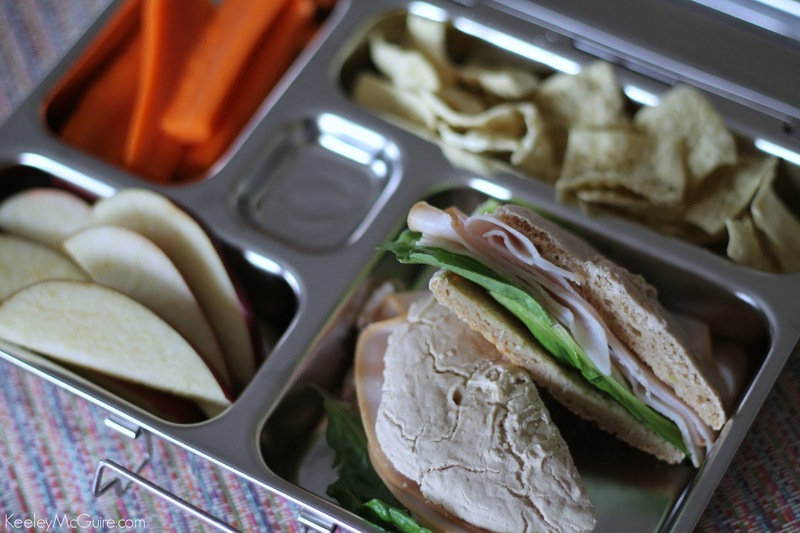 Such a fun idea for sandwiches! My family would love these! Genius to put mashed potatoes in it. I'm an Idaho girl, and I know mashed potatoes really adds the best texture! Genius idea to use the mashed potatoes. I'm an Idaho girl--so I know adding mashed potatoes gives the best texture! I'm going to have to make a huge batch of these, my family will devour them! I'm totally with you! When I see recipes that call for multiple flours.. they've lost me! (no offense). 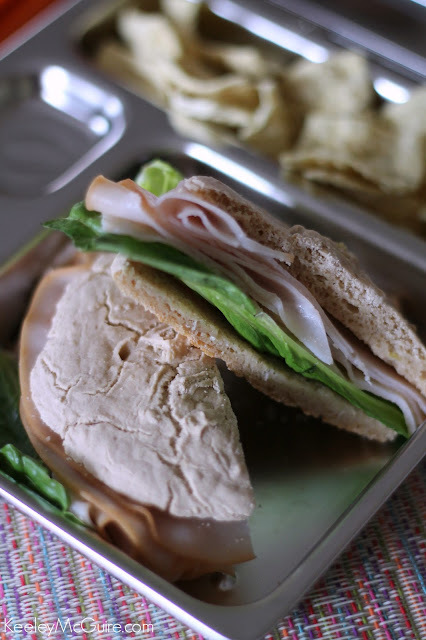 Before celiac, I used to love buying sandwich thins... now to think I can have them again! Thanks for sharing! Seriously, these look so good! Like store-bought "regular" sandwich thins!! So exciting! What a great recipe. So easy. Perfect for lunches! when I first saw these, I knew I had to make them! can't wait to give this recipe a try, Keeley! I love everything about these and the added mashed potatoes! Plus vegan- double win! Hi Eshter! As I said in the post, the outside is toasty, but the inside is anything but dry. :) It's soft and delicious.